Andrews McMeel Publishing, 9780740797354, 696pp. Long regarded as THE political touchstone cartoon of its era, Garry Trudeau’s Doonesbury celebrates its fortieth anniversary in this beautifully produced retrospective.On October 26, 1970, the first Doonesbury comic strip appeared, as college jock B.D. met his inept and geeky roommate, Mike Doonesbury. Over the months that followed, they were joined by campus radical “Megaphone Mark,” Boopsie, Zonker, and on and on. 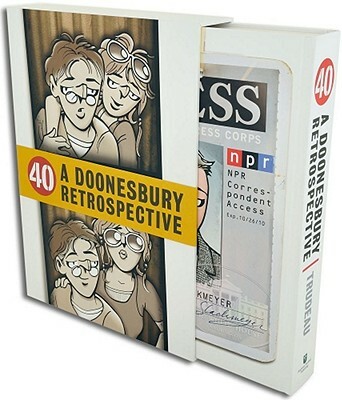 Fourteen thousand strips later, the world of Doonesbury has become a unique and remarkable creation, sustained by a vast and intricately woven web of relationships among 40 major characters, spanning three generations. While chronicling his characters’ entanglements and intimacies, G. B. Trudeau developed a keen satirical commentary that has ambitiously and relentlessly carved out an indelible record of four decades of American social and political history. The comic strip, like jazz and rock and roll, is an American form, and Trudeau has expanded it boldly and fearlessly, taking it into new realms. An epic unfolding, the Doonesbury saga constantly entices readers to keep up with its ever-evolving cast and endlessly inventive story lines. Trudeau remains fully engaged in the creation of his far-from-complete magnum opus. This massive yet elegant anniversary volume marks the strip’s fourth decade by examining in depth the characters and relationships that have given Doonesbury such vitality and resilience, and allowed it to constantly reinvigorate itself. The book opens with an in-depth introductory essay by G. B. Trudeau in which he surveys his sprawling creation as only he could, followed by brief word-and-picture portraits of all the principle players. The collection’s core consists of more than 1,800 beautifully displayed strips—dailies and Sundays—that chart key adventures and cast connections over the last four decades. Dropped in throughout this rolling narrative are 20 detailed essays in which Trudeau contemplates individual characters or bonded groups of characters, including portraits of ur-folk such as Duke and Honey, Zonker, Joanie, and Rev. Sloan, as well as those who have joined the cast more recently, such as Zipper, Alex, and Toggle. The centerpiece of the volume is a four-page foldout diagram that maps in great and annotated colorful detail the mind-boggling matrix of character relationships. A feast of storytelling and a clarifying overview, this celebratory tome offers a unique way to experience one of the greatest comic strips ever. "It's no exaggeration to say that Trudeau revolutionized the funny pages, creating a space where reactionaries and radicals alike squabble over the issues of the day." "...Packs four decades of cartoonist Garry Trudeau's subversive genius into an oversize, 695-page hardcover. What else is guaranteed to make you think, feel nostalgic, and laugh out loud at least once a page? "?